In small villages, all families were able to buy milk from the closest dairy farm. In St-Basile, it's Mr. Edouard Durand that started to deliver milk door to door with a horse drawn wagon. He was delivering milk in the village and in St-Jacques rural district. 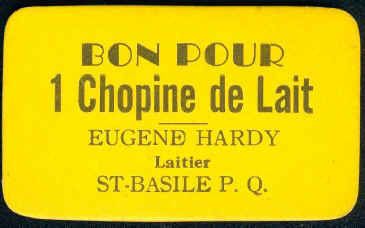 In 1934, Mr. Eugène Hardy (see token above) bought the milk route from Mr. Durand. Later on, Mr. Hardy'sons, Raymond, Gaston, Yvon and Claude continued the good work to make the business to become bigger and bigger. Because of the large territory to cover, in 1956 they had to buy a truck. 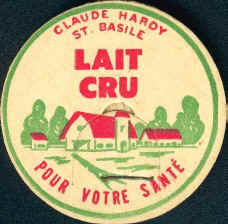 Mr. Claude Hardy continued to deliver milk till 1974. Mr. Hardy said: "In 1934, the quart of milk was sold eight cents (0,08$), we were delivering fifteen (15) to twenty (20) quarts each day and the milk was coming from my own herd." Historical received from Luce Leclerc. See "P. E. Leclerc Dairy"